The Palm Handguard™, free float tube features a triangular profile that conforms to the palm of your hand giving you a secure and comfortable grip on your AR. 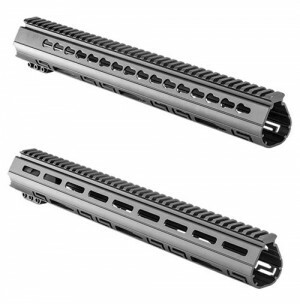 The vented version of the Palm Handguard™ provides a Picatinny top rail and KeyMod or MLOK™ slots along both upper sides, as well as a row of KeyMod or MLOK™ slots along the bottom to accommodate accessories such as a bipod. The lower sides are adorned with the Luth-AR “Double L”, and Cartridge lightning/cooling cuts to further reduce weight and provide heat dissipation with a distinctive good look. The Palm Handguard™ is made from 6061-T6 Aluminum extrusion that is hard anodized black. The Palm Handguard™ includes a Palm Handguard™ barrel nut made from heat treated alloy steel with a manganese phosphate finish. Weighs 13.8 oz, total weight with barrel nut 1.05 lbs.